Total Workshop search results: 7. 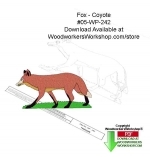 Displaying Page 1 of your woodworking search phrase COYOTE PATTERNS. Our wolf pack, howling into the wilderness, communicating with other wolves far away. 20 x 31, 30 x 24 and 27 x 30 inches in size. Make from a half sheet of plywood. Stake them to show off in a post or mount it on a tree, fence rail or the side of a barn or shed. Full size drawings. Custom sizing available. This pattern could be used to display a fox or coyote. Paint like shown, or paint all black and then detail the lines a white/grey to provide details. This is a 5 page pattern. Be sure to print all parts and join together to get the full size pattern. Beginner skill level using a jig saw or scroll saw should be able to accomplish this project easily. Nice, three dimensional coyote silhouette candle holders for use with small tea light candles sold in metal cups or glass holders. You can also use battery operated tea light candles. This is a good simple project for beginners at the scroll saw and can be made for craft shows. Full instructions are included for cutting and assembly. All 20 patterns included! Three dimensional patterns included are: Bear and Cub, Bison, Rabbits, Elk, Cats, Howling Coyote, Hawk, Egret, Dueling Caribou, Horse, Hummingbird, Labrador Retriever, Trout, Duck, Moose, Bird on branch, Swan, Tree frog, Salmon and a pair of Howling Wolves. These are simple projects for a beginner scroll sawyer and is a good project to make for gifts and craft shows. Full instructions for cutting and assembly are included. A good scrap wood project. Our Forest Leaf wildlife plaques have always been a popular choice among scrollers. Now you can get these smaller Forest Leaf Wildlife ornaments to adorn your tree for season, or to decorate your home or cabin year round. You could also enlarge the pattern, add a backboard and turn them into quick and easy plaques. This is an intermediate level scroll saw pattern. Patterns included are a fish, deer, birds, squirrel, horse and howling wolf/coyote. Link Type: free plans | Link Source: Toms Wood Portraits and Scroll Art | Visit the category | Fix Link?